LG G Flex is the phone to get if you are craving for the latest gadget experience. It has the usual makings of a new phone, fast processor, lots of RAM, a big battery, and a large display. But beyond that, it will wow people for the one simple reason of being curved. It has a number of firsts, a curved form factor, that is designed for your eyes and for an ergonomic fit in your hands. It is also designed to last, with a curved battery that maximizes battery capacity and a self healing back. Lastly, as the name suggests, it is flexible. It was an appropriate quote shared at the LG Launch Event. Would I want a curved phone? I’m not too sure. Yes in the landscape mode, it does make for a more immersive experience but less so in the portrait orientation which is how most people typically use their phones. Yes, so it does help the viewing experience, yes, it is easier to hold. But are they reason enough on their own to go out and buy one? Guess not. In a way, the G Flex really is LG flexing (pardon the pun) their muscles “look at what we can do.” It feels like an engineering prototype, just like hey, a curved screen phone is do-able. Would I want a self healing back? Definitely. This is an awesome feature especially for people who use their phone without a casing and there’s always a concern of getting scratches from coins and keys. The self healing back feature would address this. LG did mention that it is only fine for small fine scratches so don’t go all knife crazy on the phone. As you’ve no doubt seen and guess by now, the G Flex does indeed live up to its name – place it face down on a flat surface and press down on the center of the phone, and it’ll bend flat. It is a bit stiff, and takes a bit of force to make it flat, but seems to handle such stress without any problems. I thought the phone felt great to use, not too heavy. The curved form factor does make it easier to hold but it is probably more a good to have rather than a must have feature. The specifications were decent and there were only two areas that loss out to the LG flagship the LG G2, which are the resolution and the OIS. The exclusion of OIS was plain disappointing. Also, for the price (S$1088), I would have expected a premium phone, with top quality products – so the display itself is something of a letdown. First, it’s a 720p panel. A 6″ 720p panel. Yes, it is large, if you strain hard enough, you can see the pixels. One area that stood out was the notification light on the G Flex. It can glow in multiple colours, to differentiate various events. Apparently, it is an improvement over the LG G2. On the G2, the button glows around the edges – the rest of the button is opaque. 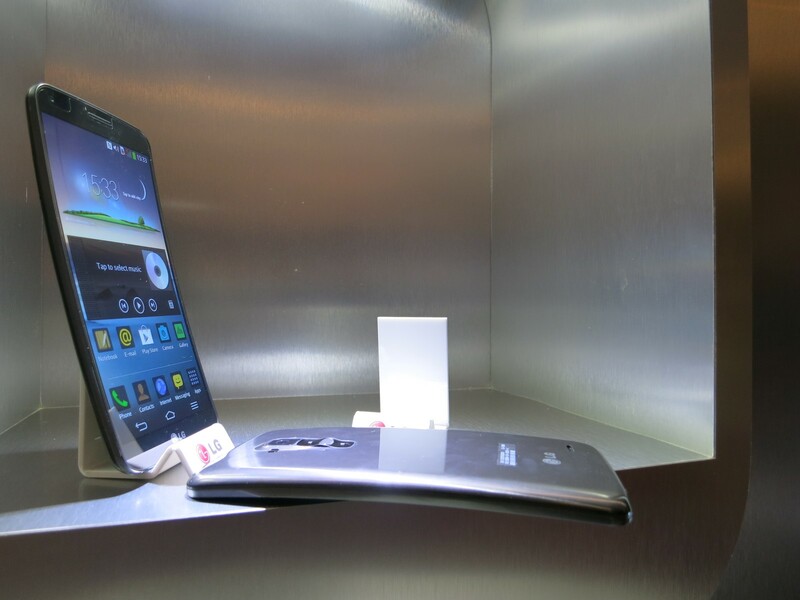 On the G Flex, the whole power button lights up when you receive a notification. The LG G Flex may not sell that many units as it might be too ahead of its times. rather it is a message to the world that LG engineering is a force to be reckoned with. It has firsts in multiple areas and to some extent can be considered a leader in this novel areas. Some of these I am sure would be features that subsequently migrate to other models. Thumbs up to LG. Other: Hi-Fi 24bit, 192kHz Playback, Swing Lockscreen, Dual Window, QuickTheater, Face Detection Indicator, KnockON, Answer Me, Plug & Pop, QuickRemote, QSlide, Slide Aside, Clip Tray, Guest Mode and etc. It will be available from 21 Dec, preorder it now for bragging rights to impress your friends and families. Pre-order also gets u a LG Vest Cover (Worth $48.00) and a LG Tone+ Bluetooth headset (Worth $178.00). Stores availability will start on December 21 at M1, Singtel, Starhub and other authorized LG mobile retailer. It will be quite the rage at Christmas party as friends try out the flex feature. I wonder if anyone would be able to break the phone and how would LG react. Top Up EZLink at Home!